Well, we’re not able to barbecue this Memorial Day, but we’re celebrating a little bit of America by making pancakes. 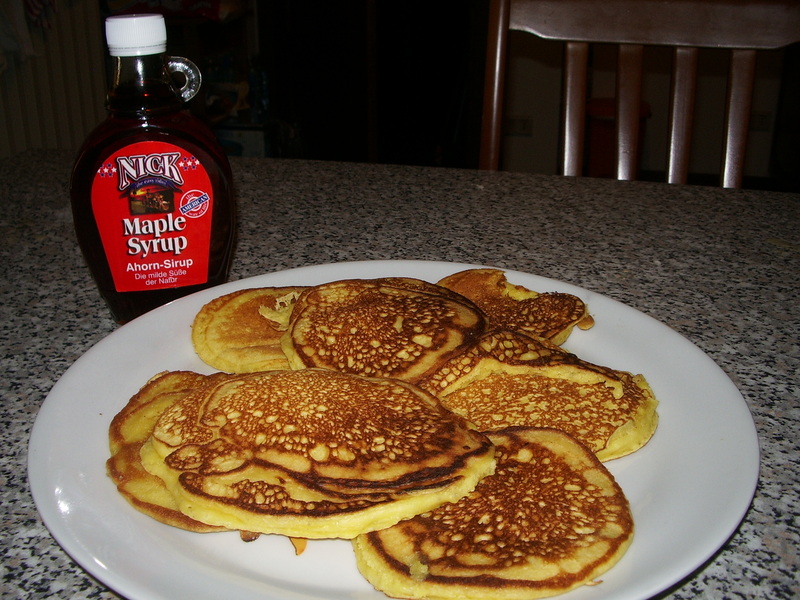 Not many Italians eat pancakes; in fact, we bought syrup at the grocery store a few days ago, and the check-out clerk was fascinated. A spark of recognition lit her face, but she was puzzled. ‘What do you use this for—to put in desserts?’ she asked. When we explained we were Americans and we used it as a breakfast condiment, she said, ‘Che meraviglia!’ and wanted to try it for herself. Breakfast in Italy is usually very light because Italians eat such a big lunch. Breakfast usually consists of a biscotto (cookie) or a croissant with a cup of coffee (sometimes mixed together in the coffee—no joke. We’ve watched people in the North and South take beautiful cream or jelly-filled pastries and crumble them unceremoniously into a large mug of milk and coffee. But they shudder when we make fried eggs for breakfast!). This entry was posted in America, American, food, Italy and tagged America, American, food, Italy, pancakes. Bookmark the permalink. Mexican food is the other cuisine we really miss! We can make burritos, etc., but it’s not the same without cilantro. And, we can’t make Margaritas here–very hard to find tequila! That is a beautiful thing. It’s also nice to know that there are some foods that we do better than the Italians, I was starting to think they were cornering the market on delicious. I know, they practically have a monopoly on delectable foods, but they can’t beat an American breakfast.